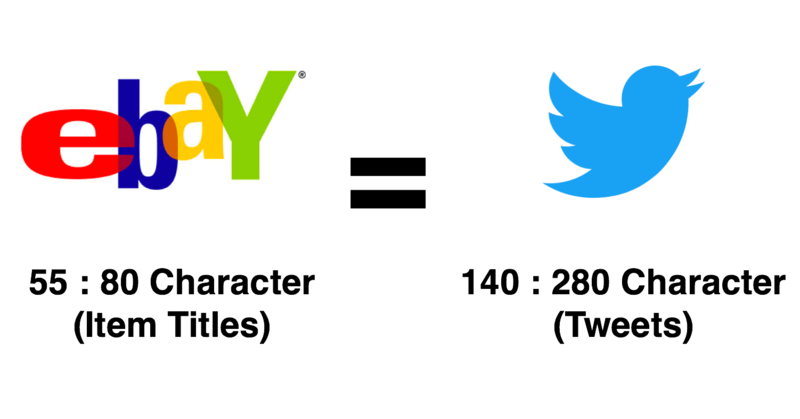 Twitter’s move to test doubling the character limit of tweets this week can’t help but remind me of internal discussions we used to have 10 years ago at eBay around Item Title length. In hindsight those discussions were pure navel gazing and distracted us from the core issues our business faced. I fear Twitter is doing the same today. It would erode listing fees like adding a second category (doubling listing fees) or adding a subtitle (50 cents). Remember these listing fees made up about a third of eBay’s revenue at that time (balance was final value fees, paypal transaction fees). It would make search results less relevant. eBay at the time worked on a pure title search and so by allowing sellers to add more words would mean some items only tangentially related to the keywords would appear (thru keyword spamming). It would be harder to visually scan. Both the item page and search results would be harder to read with a longer title. In face there was some concern that even the search results loading time would be adversely impacted. And so it went on. The topic was discussed at length and always controversial. Eventually in 2011 the company decided to expand it to 80 characters to align with Amazon and other online retailers platforms. At that point the search infrastructure had improved tremendously and was able to still provide relevant results. Did it fundamentally change eBay’s business in the end or help in its battle with Amazon? No. So what’s the big deal for Twitter? I think the lesson here for Twitter is one of putting heir energy and focus on topics that really matter. For example they should focus on the fact that Twitter is a two-sided marketplace of publishers and readers. Publishers are looking for audience and to get their message out. Readers are looking for interesting topics from the general (celebrities, politicians, news) to the more nitch (product management, design). And yet the way it’s positioned is not nearly that clear–and this 280-char test isn’t helping. Ironically Medium, who already has a much clearer two-sided value prop and now business model, is doing exactly this.